The October 2013 Fandom in a Bag swap is the Supernatural fandom. Step 1: Please list in the comments your favorite characters (Dean girl? Sam girl? Bi-bro? Cas fan? ), seasons, episodes, moments, or any other preference you may have. Step 2: After partners are assigned, check to see what your partner likes. You can follow-up with a message if you need to know more. Then scrounge up, buy, and/or create items that fit in a bag. Your bag must contain at least 7 different types of items although more is certainly encouraged (PLEASE try to make it look full). I'm bi-bro. I adore Dean, Sam, Bobby, Ellen, Cas, and Jo. I think John had his faults but did the best he could. Season 3 is my favorite. I adore the angst. I'm a canon het & also a slash fan; message me if you want to know my preferred pairings. I absolutely adore the Impala. My car license plate is KKAZ 2Y5 (the extra K is for my name LOL). And I've always loved "Carry On My Wayward Son" by Kansas so anything related to that would be great. I have an SPN charm bracelet, a salt necklace, and a Dean amulet necklace already. I ADORE SPRock, so I'd love a mix CD of free songs or a list of songs you recommend with links, if you have any favorites. I'm SO VERY IN LOVE with this fandom, so I'm sure to like anything you come up with. If you have any questions or want more details, just message me. My favourite characters are Sam and Dean. I'm into slash and my otp is wincest, but I don't like destiel. I love all the music from supernatural, so cds are more than welcome. I would love to recieve things from the show more than typical merchandising items, like fake id's, a hunter's journal, a supernatural novel etc. I have been looking for a Samulet for a long time, and I would love to have one. I'm not really into all the secondary characters as bobby, john, castiel, meg, etc but I apreciate them. I think that they have a very important place on the show, and that it wouldn't be the same without them. though I would like to receive something from gabriel or crowley. 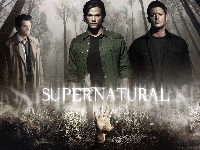 I'm in love with all the cast from supernatural, they are amazing, and anything related to them would make me happy. Hi all! I'm kinda signing up for this swap for my roommate. Once upon a time, I set up a Supernatural package swap on livejournal and she got flaked on after she spent a lot of time working on her package. So, I'm hoping I can give her some things from this swap that she'll enjoy. For Monika: Dean all the way. Demons and hellhounds were her favorite bad guys and show lore. Her favorite episode is Mystery Spot, but she likes most of the quirky/funny episodes (with the exception of Ghostfacers). Her favorite colors are red/black and dark blue. She has pierced ears and trends toward both girly and/or useful items. We have all the DVDs, music, and most of the books. She'd love something SPN related to hang on the wall. In case you still have some room in the bag, I love both bros together, the first couple of season's urban legends, and I think the Ghostfacers are hilarious. @firefly72 What a sweetheart you are, wanting to give your roommate something to make up for being flaked on. I was flaked on for two big SPN swaps I did so I can totally relate (though I had one angeled, out of the blue, and I'm still glowing with happiness about that). Salve, I'm Rem, and I am a huge platonic destiel shipper. Lovers or just friends, I do adore the relationship betwen Dean and Castiel. If I have to choose a favorite character, it will be Dean, but my heart goes for Crowley and Cass too. Angels are my favorite creatures (I have a massive wings kink), and my motto is SEASON SIX IS THE BEST. Now, the hard task. I hate, with all my heart, Sam Winchester, since the pilot. I don't wanna write here why, but please, don't send me anything about him. The only things that I already have about SPN are the samulet and Impala's plate. I would love to receive SPN Adagio's teas or plushie or something to decore my life and house (as mugs or posters or pillows or a full size Crowley XD ).